Bank Of Baroda is a state owned bank that has been in business since 1908. For more than 100 years, this banking institution has been serving countless individuals and companies. Over the time, they have modified and upgraded their banking system to provide net banking known as Baroda Connect. They have been offering internet banking facility as an alternative for 24 X 7 customer service. If you looking for information on how to register for bank of Baroda net banking online, you have come to the right place. 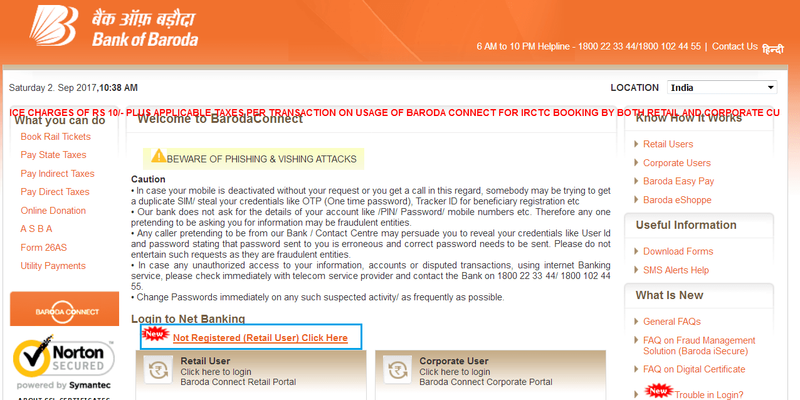 To use the net banking online services on Bank of Baroda, you need to visit the official website. If you want to access the details, you will need to get the login details by registering to the bank. First of all open the official website of the bank. Make sure there's the green lock on the front with https which means that the website is secure and safe to use. Step 1. Follow this link https://www.bobibanking.com. When you scroll down to the bottom of the page you will find two users – retail users and corporate users. The retail user is for individuals who have savings account with bank. The corporate user on the other hand is for businesses who have current account with the bank. Step 2: Above both these users, you will find a link that says "Not Registered (Retail Users) Click Here". You simply need to click on that link and it will open up a new page for you. Step 3: On the new page, you will see four steps that you need to fill. You will need to fill in your ATM Debit card details. You will enter the details of the card whether it is Master Card or Visa Card. Now enter the captcha code and validate the details. Step 4: When you click "next", you will get a one-time password (OTP) sent to your mobile number that has been registered with the bank. After entering the password, you will need to click on the Next step. Step 5: In the next step, you will have your details and you will have to choose a type of facility which can be "Both View and Txn Rights" You will have to enter three preferred 'user ID' that should be of 6-28 digits. Next choose your 'Sign On password' which should be at least 8 digits. After you complete the above steps, you will need to confirm for the last step. Upon confirmation, your user ID and password will be sent to your registered mobile number. You can log in to net banking using these details after 24 hours and can transfer money from bob account to other banks. I have registered my account with bob net banking via a retail user on 25/1/2019. How to know bank of Baroda net banking activation status? 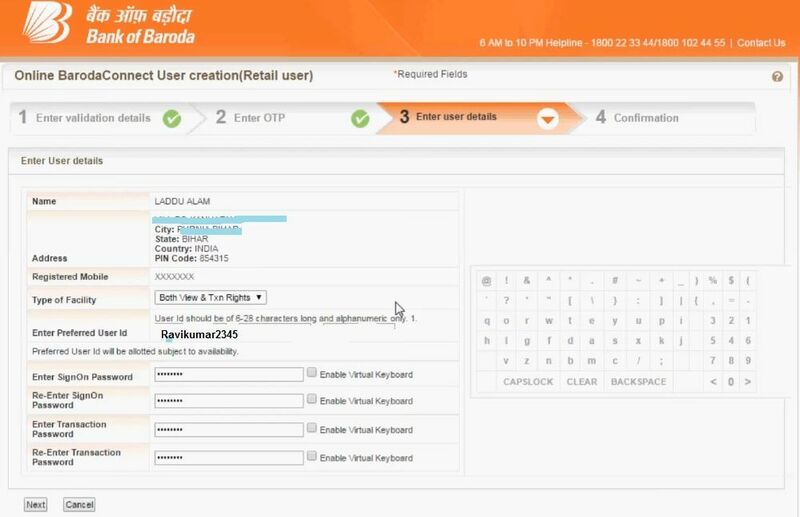 How to login first time in bank of baroda net banking?